LOS ANGELES (AP) Stephen Curry and the Golden State Warriors had looked a tad vulnerable to start the new season. They had a 4-3 record and blew a 14-point second half lead at home to the Detroit Pistons on Sunday. One day later, the team played more like the defending champions, using a stifling defense to blow out the Los Angeles Clippers 141-113. 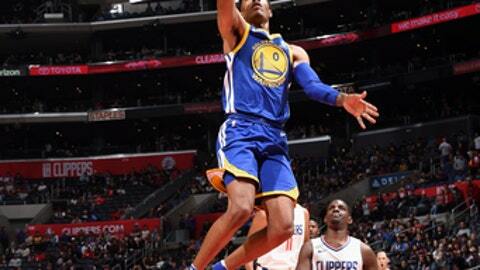 It was Golden State’s 11th consecutive win over Los Angeles. ”That looked like us,” Warriors coach Steve Kerr said. The Warriors got a terrific all-around game from Curry, who scored 31 points, hit seven of his 11 3-point attempts and added six assists and five rebounds. The Clippers (4-2) were the last team in the NBA to lose a game, but dropped their second straight despite 19 points from Danilo Gallinari and 17 from Lou Williams. The last time the Clippers defeated the Warriors was Christmas Day in 2014. Though the Clippers try to run their offense through Blake Griffin, the power forward was quickly doubled whenever he touched the ball down low and struggled to get his shot off. He finished with 16 points on four of 10 shooting. The Warriors had 37 assists on the night to 12 turnovers. They outrebounded Los Angeles 46-35 and outshot them, if only 89-86. On Monday, however, it was the Golden State defense that dominated. While the Warriors were shooting 58.4 percent from the field, they were holding the Clippers to 45.3 percent. ”Defensively, they had a field day,” Rivers said. Warriors: Stay on the road Thursday when the travel to San Antonio to meet the Spurs. Clippers: Scheduled to host the Dallas Mavericks on Wednesday.